I do other things besides backpacking, you know. As far as backpacking/camping goes, I was fortunate to have been born into a set of circumstances that has greatly facilitated my passion for the outdoors. My father was in the US Army, is the veteran of two wars, and the survival training he taught was a big influence on me. My mother was a nurse, and the same can be said of the valuable training she taught me. Both of my parents are immigrants from Latin America to the USA, and this perspective was also very valuable, as it is one that has an emphasis on being frugal and self-sufficient. In addition to the vast amounts of information made available to me through my parents, I was also given ample opportunity to put what I was taught to use. As a military family, we moved a lot, and in my youth I often found myself in a new town. Luckily these towns had plenty of woods for me to take advantage of, for example military bases in Germany when I was in grade school, and a boring little town in central Pennsylvania when I was in high school. The boring little town was both a blessing and a curse. A curse, because as a teenager in a rural landscape of only 17,000 inhabitants, there is little to do and little that caters to your desires of excitement and adventure. It was a blessing because this situation challenged me to create my own things to do, and to seek out my own excitement and adventure. Stomping around the woods with an old blanket and a can of beans was very fun at times, but many times difficult and uncomfortable, and the more challenges I faced, the quicker I learned that I lacked the skills and equipment to fully deal with what nature threw at me. Today I could have taken advantage of the wealth of resources available online, but I didn’t have that option then. This was in the mid 90’s, keep in mind, when the internet was laughable compared with today’s standards. Stuck in a small town, a fledgling internet, a tiny and dated public library, and no experts or masters on the subject (most people I knew that went backpacking or camping viewed it more as a passive, once-or-twice-a-year thing), I learned throughout high school and college mostly by experimentation, trial and error, and falling back on the tried and true methods I had learned as a child from my parents. I also began to expand my camping and nature library at home, reading many books on the subject or related to it when I could get my hands on them. After countless overnight and weekend adventures, I finally felt ready to take on bigger and better challenges by the time I was around 19-20 years old. 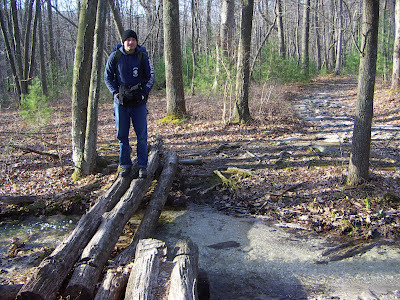 I began to go on extended trips--from one night to one week--on parts of the Appalachian Trail. On the trail, I also got the chance to trade ideas with other nuts such as myself, and midway through college I felt I had really begin to bloom as a student of backpacking/the outdoors. Below is a picture of me on the AT in PA around 2005. By the end of college I felt very comfortable in the woods, more comfortable there than anywhere else really, and able to handle most of what nature could throw at me if I had to. I also met the love of my life, a beautiful girl from Sweden, and soon after college we were married. She too shares my interest in camping, hiking, and nature, though not to the extent that I do--but in fairness to her, not many people are as crazy about the woods as I am. We went out on the Appalachian Trail together and had wonderful times, but life caught up to us, and soon we were both stuck behind a desk, working to save up so that we could move to Sweden. After moving to Sweden, I was again in my element with the forest all around me, but I also went through another dynamic evolution as an outdoors enthusiast. I continued to go out into the woods all the time and had wonderful experiences, but there were some things I took for granted, and other things I felt I had hit a glass ceiling in my learning. I craved to push myself further and continue to grow and learn, so I started to do more research on what was by the mid 2000’s a flourishing online community of backpackers, campers, and outdoor enthusiasts. While much of what I discovered online I was already familiar with, I was pleasantly surprised to find a lot of new information on the details and nuances of the many skills and aspects involved in backpacking and the outdoors, some of which were really amazing. Out of everything I evaluated online, there were two schools of thought that added the greatest improvements to my own methods and techniques: ultralight (UL) backpacking, and bushcraft (BC). The philosophies behind both of them are pretty straight forward in theory, but in practice can be quite advanced and confusing to the novice. I am forced to use generalizations to illustrate my points, and as such it should be noted that these generalizations of course are not meant to accurately describe all UL and BC enthusiasts. And of course it should also be noted that many of the ideas presented in UL and BC are nothing new (especially BC), but have been rehashed or rediscovered by many outdoors people, myself included. UL backpackers look to lighten the load of the gear they choose to bring with them as much as possible, and BC campers look to take as much advantage of natural resources around them as possible. UL campers generally rely on a lot of modern technology (e.g. silnylon tent, cuben fiber backpack, titanium pot, razor blade as a knife, etc.) and are influenced by a more eastern philosophical tenant of an attempt to reject the material in favor of living simply, i.e. "less is more." BC campers on the other hand, rely on older technology (e.g. canvas tent and backpack, steel pot, Bowie knife, etc.) and are influenced by a more western philosophical tenant of embracing materialism for comfort, i.e. freedom to choose whatever you want, weight be damned. At best UL'ers resemble Zen monks with modern, fancy gear, and BC'ers more like cowboys or rangers of old with rugged, traditional gear. At worst, however, some UL purists harshly judge anyone that hauls even the smallest of luxuries out backpacking. On the other hand, some BC extremists will harshly judge anyone that questions their choices of gear or those that suggest alternatives, viewing even the slightest constructive criticism as an infringement on their freedom to take, say, over 50 pounds of gear with them--including four knives, an axe, a machete, a saw, and maybe even a gun or two! This can be very off-putting for a novice who is not in-the-know, and at times can be irritating to veterans looking to expand their horizons, like myself. In addition to these examples of zealots, another element that is inherent with the internet (and indeed society in general) comes into play: posers. In all communities there are those that really have no good reason being a part of a given community, but do so for whatever ulterior motives. The same is true with both UL and BC, as there are pretenders in both communities. An urban yuppie might fancy themselves an ULer because they ordered lots of high-tech expensive UL gear online, only for the gear to collect dust in the closet, or perhaps used once a year on a weekend trip. Or a rural redneck might like to drop the word “bushcraft” around with their buddies while they are out hunting and/or fishing, claiming that all they would need to survive in the wild is a Rambo knife and maybe some paracord, of course never actually backing this bold claim up. But it sure sounds cool. It would not be much of an issue if the posers just continued their façade on their own and kept it to themselves, but the problem is that many of them write blogs too, or make videos on Youtube, post on forums, etc. It can be difficult for a novice to be able to tell the difference between a veteran and a poser, for it is very easy to talk the proverbial talk, but another thing altogether to actually go out into the woods and not just survive, but be comfortable. As illuminating as my experiences have been with gathering information on the internet, it has also been just as frustrating at times dealing with people who honestly don’t know what the hell they are talking about. By this point I hope my intentions are beginning to reveal themselves. It can be a real challenge to get good information on anything, let alone something with so many details and variations such as backpacking and/or camping. The purpose of this blog is to give the novice or would-be backpacker or outdoor enthusiast a good set of information to build on, and in a nutshell: create a blog that I wish I would have been able to read when I started my outdoor journey. This would have made my life much easier, and I would not have had to learn some things the hard way from my mistakes, failed experimentation, and trial and error. I could have reached the point that I am at now much sooner, with my current system and skills better than ever before, and I am enjoying and getting more out of the great outdoors now than I was in my youth. In short, backpacking is probably my favorite way to spend my free time, and is more of a passion or lifestyle to me than just a hobby. I am always interested in continuing my growth and evolution as a student of the outdoors. I hope this blog will be helpful and enjoyable to read in your quest to get out and experience nature in ways in which many people in our fast-paced, alienated society are either unable or unwilling to do. The rewards are both concrete (e.g. getting in better shape, learning many useful techniques, improved critical thinking, etc.) and abstract (e.g. beauty, peace, wisdom, etc.) for those of us that can overcome the challenge of living in harmony with nature. My wife and I at Machu Picchu in 2008.